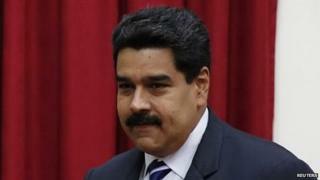 Venezuela will raise the minimum wage by 30% on 1 May, President Nicolas Maduro has announced. He said he would also raise pensions by the same amount. The increase is below the level of annual inflation, which official figures put at 56.2% for 2013. The announcement comes after almost three months of mass protests against Mr Maduro's government triggered by rising inflation, shortages of some basic goods and a high crime rate. In an address to workers from different key sectors, Mr Maduro said he hoped that "by the end of the year, we will be choking off and overcoming (...) inflation". They say strict currency controls have only increased the shortage of dollars available in the country and driven up their price further. Opposition leader Henrique Capriles said the 30% raise was "insufficient" and that a real improvement would only be achieved if wages were lifted above the level of inflation. The increase comes just months after the government raised the minimum wage by 10%. The president also did not rule out another raise in the last trimester of the year, at which point he promised to "re-assess" wages. Forty-one people have been killed and hundreds injured in protest-related violence since demonstrators took to the streets of Venezuela's main cities in February to vent their anger at the country's economic woes. They blame President Maduro for "mismanaging" the economy of the oil-rich country and have said they will not cease protesting until he resigns. Mr Maduro succeeded President Hugo Chavez in office, who died of cancer in March 2013 after 14 years as president. The supporters of Chavismo - the brand of socialism Mr Chavez championed and which Mr Maduro has promised to pursue - praise the significant reductions in inequality, poverty and malnutrition which Venezuela experienced in the past 15 years. But hundreds of thousands of Venezuelans have taken part in a series of mass protests accusing the government of "dictatorial tactics" and championing the poor at the expense of the middle class. The government and some opposition groups are currently holding talks to end the protests.